The President, it’s a monumental title isn’t it? The leader, the man with the most power, the man people turn to in times of crisis. Do you think you have a good idea of presidents? Who was the president of the Soviet Union during the Cuban Missile Crisis? True or false, the American president can appoint federal judges? Who is the current president of China? Think you know the answers to these questions? Test yourself now in our fantastic president quiz! With questions ranging from the names of presidents in various different countries, to the powers a president has, this is the president quiz! So sit back in your chair as a president would, and tackle this quiz with all your power! Do well, and your people are sure to give you a standing obviation! Best of luck! How much experience will you have before running for president? None! I will just have my looks! I will have a good amount of experience. It depends how much experience the American people decide I have. I will know what I'm doing. I would have just started getting intrested in politics. Would I be a Good President? What Presidents path will you most follow? The economy is not at it's best, there is nothing we can do to help it. The economy is horrible and it we will never get out of this recession. The economy may be bad, but we must do everything we can to fix it. How many Presidents have been elected in our country since the introduction of the post in 1950? Zakir Hussain was the first Indian President to die in office, who was the other President to have met a similar fate? I became the 17th president of the United States when Abraham Lincoln was shot. I vetoes the 14th Amendment that granted African American men citizenship after the Civil War but was overturned by congress. I allowed southern leaders to create Jim Crow laws that created segregation in the south. I was impeached because I was so unpopular with the people. Who am I? I was the great Union Civil War general who accepted the surrender of the Confederacy that ended the Civil War. Later I became the nation's 18th president. Though I was a wonderful general, I was not a wonderful president. I was very trusting. Many politicians took advantage of that and the government became corrupt. Who am I? I was president 19th president serving from 1877 - 1881. I didn't do anything to stop the southern leaders who tried to take the vote away from black men. If it hadn't been for that, people would have seen that I was a good president. I was an honest man and ended the corruption of the Grant years. My wife was a supporter of the temperance movement. Who am I? Emilio Aguinaldo is the first president of the Philippines. Ramon Magsaysay is the youngest President in Philippine History, he became president at age 27. Sergio Osmena is the first vice president to succeed as president. Please take the 10 question quiz. The quiz will be scored at the completion of the quiz and your scores will be shown to you. Be a man who owns property. Have held one major public office. Have lived in the U. S. for at least 20 years. Open Court assessment of the story Class President. This is a quiz on presidents. It will help with Academic Games. I was shot at a railroad station in Washington where I was waiting to board a train to see my wife, who was recovering from malaria in New Jersey. My two wounds should not have been fatal. However, I contracted blood poisoning when doctors probed for the bullet with unsterilized instruments. 79 days later, I died. This test helps you to know how good do you know first 5 presidents of the USA. Let's start! Who was the 1st president of the USA? Memorizing the US presidents can be a daunting task. Let's take it easy and start out with a quiz on the first five US presidents. Can You Identify These 13 Presidents At A Young Age? When was Kim Jong Un born? Can You Identify Which American State Every 20th Century President Came From? Where does Bill Clinton come from? Which president transferred colleges more times than any other? What was in the briefcase given to Judson Moon? The Ultimate Quiz About American Presidents! Use this quiz to practice for your test.Â Have fun! The Supreme Court has declared thousands of federal laws to be unconsitutional since 1789. Fill in the Blank: Lincoln was a ___. Do you know the International Presidents of Alpha Kappa Alpha Sorority Inc.? Who was the elected president of the United States in XXXX year? Who was elected president in 1988? Do you know what events occured in the terms of the first 7 presidents? Find out which President you are. Which do you like better: Socialism or Communism? What are some of the responsibilities of an AUK Club President (Select all that apply)? Which U.S. President was the first to be a United States citizen. All previous presidents were born British subjects. This quiz will test your general knowledge of President Eisenhower. Select the best possible answer for each question. 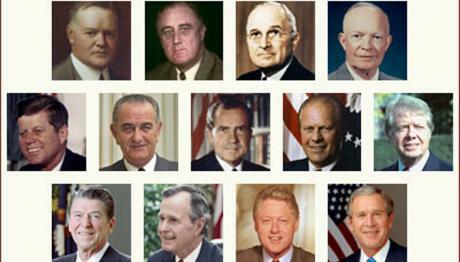 This is a quiz about the past presidents of the United States. Thomas Jeferson could not read this type of language. This quiz is to see how well you know your presidents. Have fun. Known for the Watergate scandal. How Well Do You Know Presidents? Lets see how good u are at presidents! Everyone has one. let me help you find it. If you had a DOG™ what would you name it?